← Jesus and the Canaanite woman: Divine insult or figure of speech? See this summary of the heresies and doctrinal errors taught by Fr. Ryan Erlenbush. In the comments to a post on Jesus and the Canaanite woman, Fr. Ryan makes personal attacks on me. I’d like to use this blog post to respond. “Jonathan is not really speaking for himself, he is simply copying the argument of a “Roman Catholic Theologian” named “Ron” [the guy is an extremist, he really has it out for me (and Jimmy Akin, Taylor Marshall, Michael Voris, et al.)] … this guy obviously knows very little about the Scriptures. 1. I stand corrected on the interpretation of ‘Simeon the Canaanite’ (or Cananean). I have corrected my blog post on that point. However, according to the Catholic Encyclopedia entry on Saint Simon the zealot, the name is not derived from any place, not Canaan, and not the city of Cana (as Fr. Ryan asserts). As for my Bible translation, I am translating from the Latin. All the Latin sources have the term as Chananaeus (Sistine, Clementine, Nova Vulgata) and the traditional translation found in the Douay Bible and even in the NAB is to call Simon ‘the Canaanite’ or ‘the Cananean’. This is perhaps a problem in the Vulgate, due to the rendering of the word from Hebrew, into Greek, and then into Latin. I don’t believe that this particular error, in interpreting the term used to describe Simon, justifies the assertion that: “this guy obviously knows very little about the Scriptures”. This is a rash judgment, which has the effect of denigrating my entire work with the Bible, supposedly for one small error. Fr. Ryan errs in a very similar way, by misinterpreting the term as referring to the town of Cana (rather than the place Canaan). Saint Jerome also errs in this way, misunderstanding the term applied to Simon. And yet we cannot thereby conclude that he knows very little about Scripture. But in reality, this derogatory comment by Fr. Ryan on my knowledge of Scripture is not really based on that point about Canaan, but on the fact that I frequently disagree with Fr. Ryan’s assertions. 2. When I refer to myself as a Roman Catholic theologian, I don’t put the word theologian in capital letters. It is a descriptive term, not a title. I do not claim to write with authority. Each of my theological arguments stands or fall on its own merits. But when Fr. Ryan cannot refute my arguments, he simply claims that I am not a theologian, putting the term in quotes to imply that it is not true. A theologian is someone who writes theology. 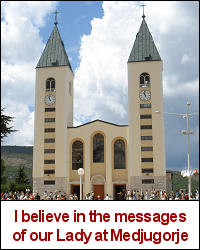 I am a believing and practicing, baptized and confirmed Roman Catholic. I write theology based on Sacred Tradition, Sacred Scripture, and the teachings of the Magisterium. I am a Roman Catholic, writing Roman Catholic theology for a Roman Catholic audience. I have been writing theology nearly every day for many years. I have written over a hundred theology articles (not counting posts). I have written and published eight theology books (so far). I am currently working on three more theology books. It is a fact that I am a Roman Catholic theologian. Now from time to time, I receive e-mails from various persons, who claim that I cannot be a theologian because I have stated a theological opinion with which they disagree. But this cannot be the basis for determining if a person is a theologian. For every theologian with a substantial body of work will have some who agree and some who disagree. The mere fact that some persons disagree with my theology cannot be the basis for claiming that I am not a theologian. No theologian could meet that type of absurd standard. Neither is it true, as Fr. Ryan implies, that a person is not a theologian unless they have some type of approval from their local ordinary (the Bishop in charge of the diocese). The term ‘theologian’ is not a title issued by ecclesiastical authority. It is a description of one way to exercise the apostolate of the laity, which derives from the call of Christ to spread the Gospel. That call applies to all the baptized, especially to the baptized and confirmed, in accord with the gifts, graces, and providence of God. A theologian is someone who writes theology. The weight of each theological argument and the value of the work as a whole is a matter of opinion. Similarly, a painter is someone who paints. A person with a degree in fine arts, who does not do art is not an artist. A person with no degree in fine arts, but who does art every day, is an artist. No formal recognition or approval is needed. But the final judgment of the value of that art, of that theology, is rendered by God. 3. As for the rest of the above quote from Fr. Ryan, I’m not sure what to say. Why does he put my first name in quotes: “Ron” ? It seems to be merely a way to express contempt. Fr. Ryan says: “[the guy is an extremist, he really has it out for me (and Jimmy Akin, Taylor Marshall, Michael Voris, et al. )]” What is the basis for his use of the term “extremist”? It seems to be only that I disagree with him, and perhaps that I offer theological arguments he cannot refute. Now theology does tend to fall into a range of different views, from liberal to conservative. A theologian could be very liberal or very conservative in his theological positions. I’m not sure if the term ‘extremist’ would apply, even in those cases. But my views range from liberal on some points (e.g. my views on salvation for unbaptized infants, on implicit repentance, on the possibility of salvation for atheists), to moderate on other points (e.g. on Vatican II, which I hold does offer new magisterial teachings, on how often papal infallibility has been used, on non-infallible magisterial teachings), to conservative (e.g. on sexual ethics). By comparison, Fr. Ryan is plainly a very conservative Catholic; his theological positions are far more conservative than the vast majority of priests and theologians today. He is further to the right than I am on almost all issues. So it does not make sense to say that I am an ‘extremist’. The only apparent basis for this claim is that I strongly disagree with his claims on certain matters of faith and morals. I argue against those theological assertions by Fr. Ryan that I believe are rash, false, injurious to souls, and contrary to sound Catholic theology or definitive magisterial teaching. My articles contain lengthy theological arguments, based on Sacred Tradition, Sacred Scripture, and the Magisterium, based on both faith and reason. I also argue against errors promoted by other persons, including those named by Fr. Ryan. However, I would not put Taylor Marshall in the same category as Akin and Voris. The errors of Akin and of Voris on doctrine are very grave, reaching even to the extent of heresy. For example, Jimmy Akin’s description of transubstantiation is heretical, even to the extent of directly contradicting the Canons of the Council of Trent: Jimmy Akin’s heresy on Transubstantiation | More on Jimmy Akin’s heresy against the dogma of Transubstantiation. Akin goes so far as to claim that all Conciliar anathemas are null and void. The explanation of Michael Voris on the Trinity is a grave heresy, in that he distributes attributes of the Divine Nature among the individual Persons. See my post here. I argue against these errors because they do grave harm to souls. I’m not ‘out to get’ anyone. And I don’t believe that Fr. Ryan agrees with the errors being promoted by Akin or Voris. “I hope that you look at my comment to Phil at 10:50am … you can see that our friend Ron is not qualified to be a “bible translator” (not only because he has not received the approval of his bishop, but also because he simply doesn’t know the languages or the tradition well enough). “Why is it that you are so vexed by the fact that Jesus applied this insulting “evil word” (dog) to the woman? She was, as John Chrysostome points out, willing to receive it in humility and to humble herself still lower. 4. My work as a Biblical scholar is described here. I worked nearly every day for five years in order to translate the entire Vulgate Bible from Latin into English. And then I placed my translation in the public domain. 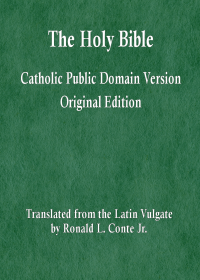 The Catholic Public Domain Version of the Sacred Bible. It is a fact that I am a Bible translator. To say otherwise is to utter a falsehood. I also worked on the World English Bible (some of the Deuterocanonical books). I was a proof-reader for the Tweedale edition of the Vulgate (London, 2005). I produced my own edit of the Clementine Vulgate Bible (in Latin). I researched and wrote a book of New Testament Biblical chronology. I am currently researching and writing a book on Old Testament Biblical chronology. However, my expertise is in Latin, not in Hebrew or Greek. So my error on the epithet given to Simon is understandable. Fr. Ryan’s statements implying that I am not a Bible translator are patently false. I think that he makes this type of denigrating remark, putting the phrases “Roman Catholic theologian” and “Bible translator” in quotes, as a type of ad hominem argument. He is unable to refute my theological arguments, and so he makes personal attacks. He claims that my error on the interpretation of the name “Simon Chananæus”, mistakenly thinking that it refers to a place (Canaan), proves I am not qualified to translate the Bible. However, both he and St. Jerome make a similar error, thinking that the name refers to a place (Cana). The Catholic encyclopedia article is convincing on both points. Obviously, one error by St. Jerome or by Fr. Ryan does not justify the type of sweeping condemnation of one’s qualifications or work that Fr. Ryan applies to me. This is further proven by the observation that Fr. Ryan has been making these types of personal attacks on me for some time prior to my error in a blog post on Simon. So it cannot be true that the basis of his remarks is that error. Rather, the basis is that I not only disagree with Fr. Ryan on several important matters of faith and morals, but I offer several lengthy theological arguments proving his position wrong. 5. Fr. Ryan’s demeanor in replying to persons who disagree with him is unbecoming of a Catholic priest. “You should start your own blog … no your own university! “You are clearly so much wiser that St. John Chrysostom (whom you have consistently ignored throughout this whole discussion). The poster named Jonathan is ridiculed by Fr. Ryan for taking the faithful and reasonable position that our Lord Jesus Christ would not insult anyone. Fr. Ryan speaks like a poorly behaved child, giving much the same type of reply that children use, basically saying: ‘You think you’re so smart…’ If you disagree with him, you are “drinking the Kool-Aid” (an metaphor often used in political discussions), but he is drinking from “the wellsprings of salvation”. Fr. Ryan speaks as if he cannot be mistaken, and as if all who disagree have gone far astray. As for the ancestry of the 12 Apostles, I had a previous disagreement with Fr. Ryan on the ancestry of persons mentioned in the Gospels. Anyone can see from my chart on the ancestry of Simon that I understood his ancestry to be Jewish. However, it is not unusual for a non-Hebrew to become a Jew, or for a Jew to have some non-Hebrew ancestors. 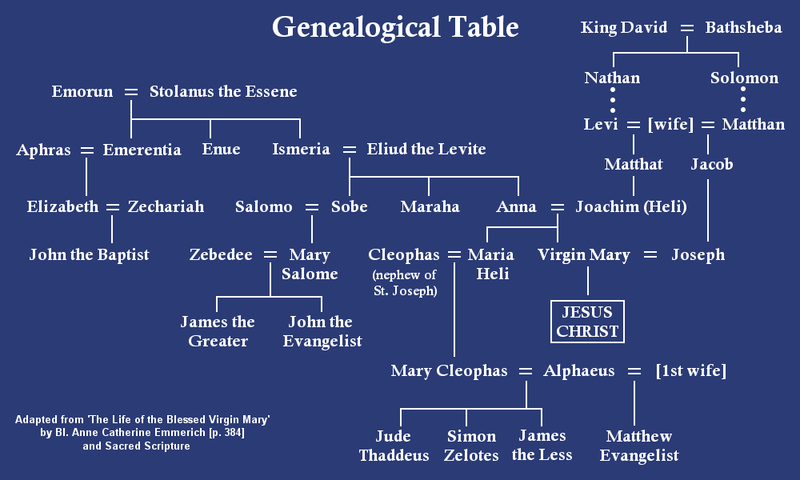 At least one ancestor of Jesus and Mary is non-Hebrew: Ruth, the wife of Boaz. As for the ancestry of Simon’s father, Alpheus, we presume that he was Hebrew, but not much is known in particular about his ancestry. If making a mistake on ancestry disqualifies someone from writing theology, then Fr. Ryan would be so disqualified. For he makes several errors in his attribution of the relationships and ancestry of persons in the Gospels. On the point about the mistake on “Simon Chananæus”, Fr. Ryan makes the same type of mistake that I made, erroneously thinking that the term refers to a place (Cana). So again, if this type of mistakes disqualifies someone, then he would also be disqualified. But really these are just excuses that Fr. Ryan uses because I disagree with his theological positions. The arrogance in this statement “let the detractor be silent” is astounding. Again, it is clear that anyone who disagrees with him is to be condemned, denigrated, ridiculed and ordered to be silent. Who talks like this? Even the Pope and the Bishops do not ridicule and denigrate persons who disagree with them. Even they do not say “let the detractor be silent”. It is a fact that I am a Roman Catholic theologian. I have a substantial body of work in theology, a translation of the Bible into English, an edit of the Latin Bible, and other works. But I do not say to my readers that I should be believed for any reason other than the theological arguments that I offer. Each of my writings and assertions stands or fall on its own merits. “I am sick and tired of your libelous comments … also, I find it ironic that you have many times criticized me for citing Thomas Aquinas as an absolute authority, yet you turn around and cite the private revelations to Bl. Emmerich as a proof that my teaching (which is nothing more than an explanation of the Council of Trent and its Catechism) is false. Bl. Emmerich would be scandalized to see her revelations cited in such an idolatrous fashion! “The Council of Trent call Extreme Unction the “completion of Penance” (Denz. 907) … as only those who have sinned can receive Confession, so too only those who suffer from the wounds of sin can receive Anointing. I had cited Blessed Anne Catherine Emmerich describing the reception by the Blessed Virgin Mary of Extreme Unction as proof that a person can receive the Sacrament, even without any past personal sins. This implies that the Church has the authority to give the Sacrament to little children. Why is this argument scandalous or idolatrous? Merely because it contradicts Fr. Ryan’s position. The term ‘theologian’ is not a title, it is a descriptive term (and given the current state of theology today, not a particularly complementary one). I am a theologian because I have been writing Roman Catholic theology for many years. I am a Bible translator because I did in fact translate the entire Bible from Latin into English. Fr. Ryan would not call himself a theologian. But I would call him a theologian, because he writes theology (on his blogs) on a continuing basis. However, Fr. Ryan does not have any published books of theology, and he has done no substantial work with the Bible. He denigrates and ridicules my many years of work for the Lord Jesus Christ and for the Church, solely because I offer theological arguments contrary to his own position. Am I the only one he treats this way? What is Fr. Ryan’s response? Don’t talk to me about being a “good Thomist”; have you even read the articles on Baptism and (since you bring it up) the Eucharist? St. Thomas states very clearly that the necessity of the Eucharist for salvation is such that a desire for communion is sufficient in those who have not the opportunity to make a communion. I am sorry that I didn’t “make enough distinctions and counter distincyions” for you…I am still trying to figure out what a “counter distincyion” is…as soon as I discover what this interesting reality is, I will be sure to make a few! On the other hand, I am quite sure that I have made enough counter distinctions. The response of Fr. Ryan (in this older comment, still posting under the pseudonym Reginaldus) is verbally abusive. He calls Paul Dion (a Catholic blogger) an idiot; he ridicules him for a typo in his post (distincyion instead of distinctions). He implies that he is not Catholic. He denigrates the man’s degree, even though Fr. Ryan has the same degree, an STL. And he derides him, by calling him ‘Paulie boy’. This official Vatican pretty well demolishes the concept of limbo and its publication was authorized by Pope Benedict in January 2007. He makes a good point. What is Fr. Ryan’s response? Your comment is ridiculous. If you had read the document from the ITC (which DOES NOT share in the “official Vatican” magisterium), you would know that the document does not “demolish the concept of limbo”. “Rather, the ITC (which is only a consultative body to the CDF and not an official arm of the teaching authority of the Church) explicitly states that the faithful are still free to believe in limbo. The ITC only pointed out (as I have in the post) that the idea of limbo has never been an officially declared dogma of the Church — therefore, theologians may speculate about other possibilities. Fr. Ryan calls his comment ridiculous, accuses him of lying and of lacking integrity and honesty. This is how he responds to those who disagree with him. “Of course there can be 1st class relics of Jesus. “In the marvelous “Mystical City of God”, by Venerable Mary of Agreda, we can read as part of her description of events around the Circumcision of the divine Infant, how Mary and Joseph preserved in a crystal vessel the blood and flesh of Jesus. This commenter also makes a good point, and he offers a quote to support his position. How does Fr. Ryan reply? This next example is hard to believe. Fr. Ryan writes a post on the topic of fraternal correction, in which he claims that “we are bound to correct only our equals and inferiors, for these only are rightly called thy brother.” So if only our equals and inferiors are rightly called brother, then who would be able to call Jesus his brother? For Jesus is superior to us all. Yet Sacred Scripture says that we are all brothers to Jesus: “For those whom he foreknew, he also predestinated, in conformity with the image of his Son, so that he might be the Firstborn among many brothers.” (Romans 8:29). I am sorry you did not answer my question. I have nothing against the Saint, but I had never heard him referred simply as ‘The Founder’ before, as Aristotle is the Philosopher or Saint Paul is the Apostle. It is not as if there are no other great founders with relevant writings, from St. Francis to St. Ignatius and St. Teresa to so many others… So, unless one is in the Prelature, calling him ‘the Founder’ is pure affectation. You leave an anonymous comment (though I have asked many times and have a clearly stated policy that you must at least use a pseudonym), mocking the fact that I call St. Josemaria Escriva the Founder … adding nothing at all to this discussion … simply trying to “one-up” me and look intelligent yourself … and, after all that, you have the nerve to leave another ANONYMOUS comment to the same effect (after I did not publish the first, since it was anonymous). If you have any charity at all, leave your name or a pseudonym, claim your previous two comments, and state your question in charity. When you do this, I will be happy to answer. The comment by ‘Anon (10:51am)’ was a very mild disagreement, solely on the point of what to call St. Jose-maria. But the response is all out of proportion to that small disagreement. Fr. Ryan claims that he is being mocked, accuses the commentator of trying to one-up him, of trying to make himself look intelligent. He expresses great outrage merely at the fact that the comment was anonymous (commentators are supposed to use a name or pseudonym). He accuses him of being ‘terribly rude’ and claims that he owes an apology. And Fr. Ryan sees these harsh words as fraternal correction. The hypocrisy of the above example is stupefying. But what he says about the priest being superior to the layperson fits with his behavior. He feels perfectly justified berating and demeaning any layperson who comments on his blog, because he is superior, and everyone else is inferior. I have met many priests in my life. I have heard many good and bad sermons. I have had priests as professors in college. I have met some priests that I admired and some whom I did not admire. But I have never in my life even heard of any priest behaving in such a contemptuous, juvenile, and condescending manner toward anyone and everyone who disagrees with him, as Fr. Ryan Erlenbush. It is quite an understatement to say that he does not take criticism well. This fault is often found in the far right within Catholicism. Very conservative Catholics tend to have very rigid views, and when challenged with disagreement, especially supported with some basis in faith and reason, the response tends to be not very thoughtful or theological. I could give many other examples. I have noticed this behavior by Fr. Ryan concerning those who disagree with him, especially when their disagreement has substantial basis, many times. In some cases, Fr. Ryan goes back later and deletes the disagreeing posts and his own response, as he has done with some of my past comments. Currently, he does not allow any comments from me at all, nor will he link to my blog posts presenting a theological argument in opposition to his position. He apparently has no confidence that his readers will choose his theological argument (or lack thereof) over mine. But in my posts, when I disagree with him, I link to his posts and quote from them as well, so that my readers can see his position and decide for themselves. Fr. Ryan often claims, in response to legitimate theological arguments and criticisms, that he is merely presenting the teachings of Popes, Councils, Fathers, Saints, and Doctors of the Church. But while he often cites such sources, he presents his own opinions — based in part on those sources — as if they involved no interpretation of his sources, and as if his position needs no theological argument. Often, he does not write theology per se, but rather an explanation of what he thinks a source is saying. He treats his sources, even those that are not magisterial, as if they were infallible. There is no acknowledgement that a Saint might err in a theological opinion; the opinions of St. Thomas and others are treated like dogma. And there is no acknowledgment that Fr. Ryan himself might err in his interpretation, nor even that he is offering an interpretation. Any theological argument to the effect that Fr. Ryan’s interpretation is not correct is met with anger, accusations, or the repeated claim that this is what the Fathers and Doctors all taught. This error is similar to that found in Protestant fundamentalism. The fundamentalist says that Scripture is inerrant; I agree. Then he explains his interpretation of what a passage from Scripture means. I disagree, and give a different interpretation. But the fundamentalist rejects the very idea that he is offering an interpretation. My position will always be seen as an erroneous interpretation, whenever it disagrees with his position, because he does not realize that he is offering an interpretation that may err. The fundamentalist thinks he is merely explaining what inerrant Scripture says. The possibility that he has misunderstood the text, or has misapplied it to the topic at hand, does not even enter into his consideration. In effect, he makes himself to be infallible. So it is also with Catholic fundamentalists. They speak as if whatever they present cannot err. They assume that all their sources are infallible, even though the Magisterium is only infallible under certain conditions, and other non-infallible sources, even Saints and Fathers and Doctors, are fallible. They do not acknowledge that their own interpretation can be mistaken. Like the fundamentalist Protestant, they see themselves as merely presenting what is in itself certainly true. Another methodological problem in Fr. Ryan’s writings is that he disregards many sources. He does not believe that the documents of Vatican II contain any new doctrines. He does not give much consideration to recent magisterial documents, except when the source is in agreement with his position. He treats the Catechism of the Council of Trent (a non-infallible source, not issued by the Council) as if it had Conciliar authority. He disregards the Catechism of the Catholic Church when it is incompatible with his views. He shows open contempt for modern-day theology and Bible commentary. His theology has few recent sources, other than a few strict Thomists. He equates Thomism with theology, and shows no regard for other theological approaches. Rather than teaching from Sacred Tradition, and Sacred Scripture, and the Magisterium, he writes from a small subset of sources, which he uses uncritically. He tends to treat fallible sources, such as St. Thomas, Fr. Cornelius a’ Lapide, and Reginald Garrigou-Lagrange, as if they were infallible magisterial teachings, rather than fallible theological opinions. He does not explicitly claim that these sources are infallible. But in his methodology, he does not critically evaluate these and other sources. He presents a quote as if it needs no supporting argument, and as if his interpretation were not an interpretation, but a statement of fact. The fallible source is treated as infallible, and the interpretation is treated as obvious and inarguable. Fr. Ryan’s response to those who disagree with him is sinful: he ridicules, denigrates, makes accusations, makes personal attacks, and behaves in a manner thoroughly unfit for a Catholic priest. His denigration of my many years of work for Christ and His Church shows disdain for modern-day theology, disregard for the many gifts of the Holy Spirit exercised by the faithful, and disrespect for a Roman Catholic translation of the Sacred Bible. I will continue to write articles advising the faithful of the grave doctrinal errors in the writings of Fr. Ryan Erlenbush. I am concerned about the harm done to many souls by his erroneous theological positions, which at times reach even to the extent of heresy. But I am also concerned about the grave scandal caused by his behavior towards those who disagree with him. As a priest, this type of behavior is entirely unacceptable, regardless of the theological positions taken by other persons. Fr. Ryan is not imitating Christ when he engages in insults and name-calling, and when he denigrates and demeans those who are outside of his narrow set of opinions. Christ would NEVER behave in such a manner. Christ did NOT behave in such a manner toward the Canaanite woman. Fr. Ryan is injecting his own attitude and behavior into his interpretation of the passage on the Canaanite woman, when he claims that Christ deliberately insulted, denigrated, demeaned, and humiliated this woman. That is exactly how Fr. Ryan behaves toward persons who disagree with him. It is not how Christ behaves. Gallery | This entry was posted in arguments, theologian. Bookmark the permalink. Ron, very well defended. I also found Fr. Erlenbush to be very denigrating of people who don’t agree with him. Please do continue to underline doctrinal errors he or others may make when they explain the Catholic faith. I have come to understand you do this for the sake of truth.